The most common question you get is, what’s the difference between MIL and Gauge? Well, MIL and gauge are actually the same thing. They’re a way of measuring the thickness of vinyl. It depends on what type of measurement you’re looking for. You use a micrometer in order to determine the thickness. A thicker vinyl is obviously going to be stronger and have more longevity. Are there pros and cons to installing a heavy gauge liner over a standard? Or, vice versa. Installation is going to be the same across both. A heavier gauge vinyl is going to be a little bit more difficult to work with because it’s a heavier product. In the long term if you get that heavier gauge vinyl installed properly it’s going to be more durable and last longer. The lighter weight vinyl is going to be a little easier to install, it’s going to stretch a little bit more, but it’s not going to have the same longevity as you’re going to have with the heavier upgraded pool. 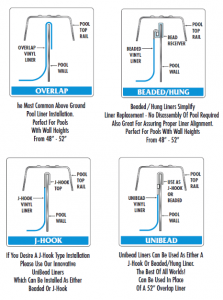 For installing overlap, beaded and J-hook liners as their advantages and disadvantages of any of those? There definitely are. An overlap liner and a J-hook liner in most cases you’re going to have to take off the top rail, which makes installation a little bit more complicated. Inversely, when you have an overlap liner you don’t have to have an exacting measurement of the pool. If you’re going to do a J-hook or a beaded liner the pool has to be perfectly measured otherwise the liner won’t hang properly, it won’t look proper once it’s filled up with water. Another disadvantage of the overlap liner is that in many cases you’re going to see that liner when you’re outside the pool, whereas the J-hook and the beaded you’re going to get a truly straight line, so the top tiling on the liner is going to be perfectly straight and look really great from the inside and the outside. What’s covered and what’s not covered as far as warranties go? Basically, our warranties cover seam separations. We’re looking for manufacturer defects, which would basically when we do our RF welding, which we do lap welding, which is the strongest available out there. RF stands for Radio Frequency. These liners aren’t glued, they’re actually electrostatically welded together using a process that has been around for about 50 years, about as long as our company’s been around. We’ve been around since 1975, so we know what we’re doing. We make it the strongest way, the best way possible. Basically, warranty’s going to cover seam operation. If a vinyl fails it’s because the consumer has damaged it by jumping in with golf spikes or dog jumping into pool and trying to get out of the pool more often, that’s what my dog does. We cover seam separations, we also have a pro-rated warranty replacement that the consumer would come directly to us. How long they’ve had their pool would determine how much they’re pro-rated warranty replacement would be, which is actually nice for most consumers. How does water chemistry affect the life of a liner? That’s the most important thing for any liner. People talk about water chemistry. Some people just think that you want to throw some chlorine in your pool. It’s really more about a water balance, where you want to have the right pH level and the right chlorine level in order to make it so that microorganisms don’t start growing in the pool which can then damage or discolor the vinyl. Another thing for people to watch out for that they don’t think about with water chemistry is things like, you went to the beach and you were in salt water or you got to put your sunblock on or your feet are dirty. All those things get into the pool and can affect water chemistry and can then in turn stain the liners. If you catch them quickly with proper maintenance and proper upkeep cleaning then those stains would be easy to get rid of using the right stuff. 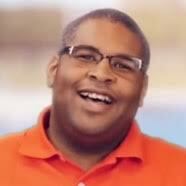 Don’t use off-brand stuff, use stuff that your pool guy tells you to buy. Those things will come up nice and clean but that also factors in with chemistry. Things like rainfall or a bunch of people going to a saltwater beach and then jumping in a pool can throw your chemistry off in a day. It’s something you really need to keep on top of. 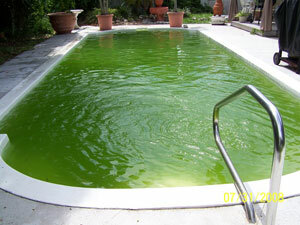 Further reading: How to Clean a Green Pool? Is there a liner option for people that want to go maybe a couple feet deeper? There is. The standards are you’re 48 and 54, but we do make above-ground pools with hoppers, where they have a deeper end. That just has to do more along the lines of making it so that when you build the pool you get it properly measured so we at the factory can make something that fits nicely. Like something for above-ground pools to go with an expandable liner? What is virgin vinyl and why is it important to go with a manufacturer who does use virgin vinyl? When you say virgin vinyl, it means that no recycled materials are being used. I know we’re all very much into recycling. We all should be recycling, but when it comes to a pool liner, if you’re using recycled materials, that could compromise the strength and elasticity, what we call “cold crack resistance.” If you’re in northern climes, it’s going to get cold. We have the highest cold crack resistance in the industry partially because of our Lamiclear technology which is a patented formula that we use, but it’s also because we’re using the 100% virgin vinyl so there’s nothing that is making it so that the material isn’t the purest polyvinyl chloride available. If you searching for a replacement liner, take a look at Inyo’s Liner section.